Today, we are launching Opera 60, codenamed Reborn 3. With this release, we believe we are setting a new standard for browsers. 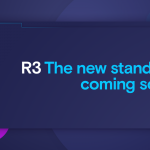 In our entire Reborn series, we have challenged the browsers of today, aiming to provide you with features that, we believe, improve your online experience. With this release, we are introducing a new, borderless design inspired by low-key and high-key lighting photography. It turns the browser into the perfect frame for the Web. 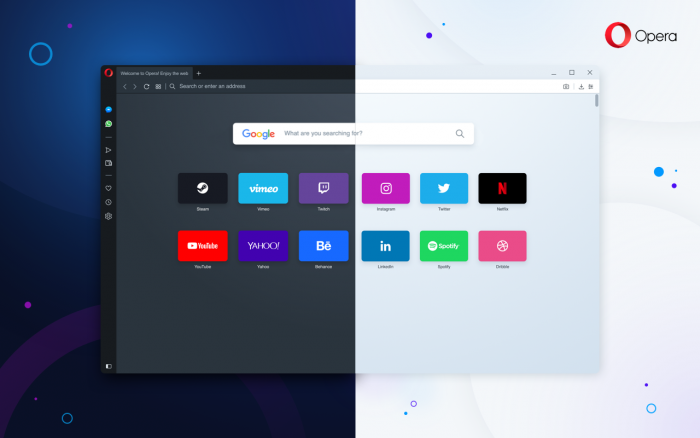 We believe these features should constitute the new standard of browsing and that users shouldn’t settle for anything less. After all, the browser remains the most important application through which you interact with the Web over many hours each day. 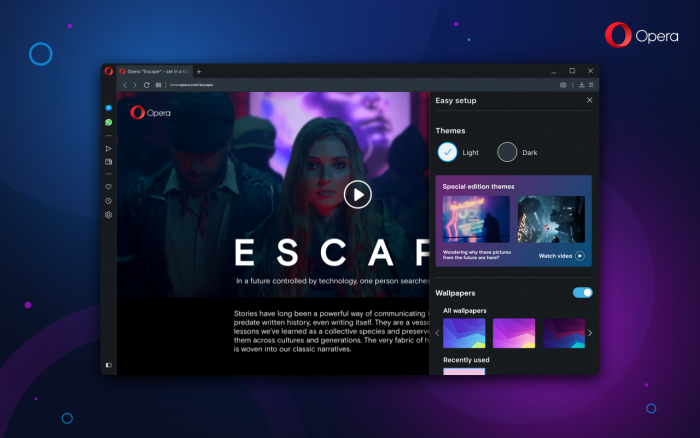 At Opera, we want to improve the quality, privacy and security of your web browsing and to give you access to features other browsers don’t yet have. 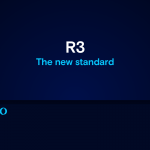 With Reborn 3, we put Web content at center stage. We’ve removed dividing lines between sections so you can browse without borders and unhindered by unnecessary distractions. And, just as no one frame is effective for every picture or in every lighting, we’ve given the browser two distinct themes, light and dark. The design of each of these themes was inspired by high-key and low-key lighting photography, where the goals are to maximize or minimize the amount of light in a photo while still retaining contrast. Depending on your mood, your setting or the content you are viewing, you are in control of how you frame the Web. It comes down to what works best for you – we’re giving you a choice to frame your web browsing in a way that works for you. Our vision of minimalism is such that your browser is more functional for your daily use, not less. That’s why, with this release, we have moved some of the features to make them more accessible without getting in your way. Tabs have been redesigned to elicit a visceral response; whichever tab you have open, it feels physically open and stays on top of other tabs. After thorough testing we have also decided to move Easy Setup and snapshot to the access bar, where they are better placed for convenient access. Once you access the Easy Setup area, you will also notice two “special edition” themes. They have been inspired by a short, futuristic film we shot to depict the journey we go through our everyday lives to regain control over our digital lives. 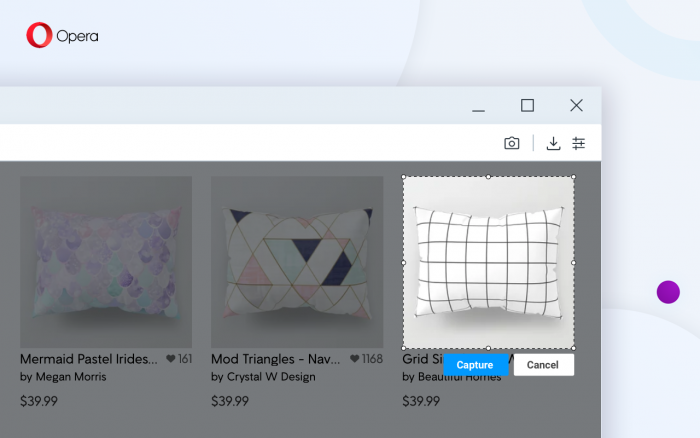 The snapshot tool, which lets you take screenshots of a website, has now been placed next to other web browsing functionalities such as “Send to My Flow” and bookmarks. This means that all the key interactions you can have with a website, such as adding it to bookmarks, sending it to your “Flow” or taking a screenshot, are in one place. 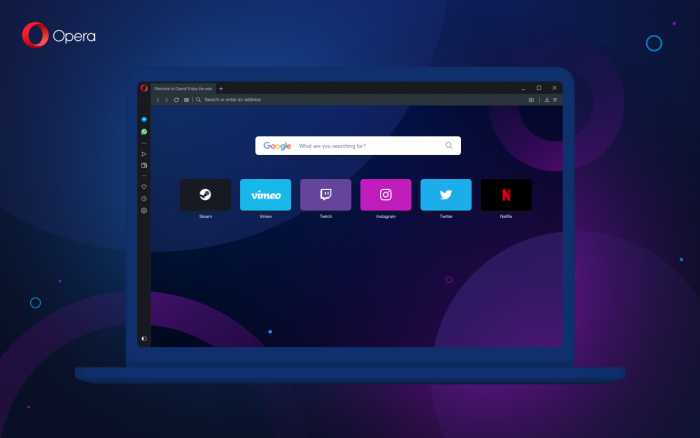 Opera is the only browser which features a built-in VPN service. This is a feature we have been offering for a while but we now have made it much faster. A virtual private network, or VPN, replaces your local IP address with a virtual one, making it difficult for websites to determine the location you are browsing from. We consider your location to be your own private information, and if you wish to withhold this while you are browsing, we believe you have the right to do so. Using a VPN also protects you when browsing on a public network from other users sharing this network. Many third-party VPNs have expensive rates, low data limits and are based around unsafe extensions. Our browser VPN is completely free and unlimited, as well as being a no-log service. Our VPN servers do not log or retain any activity data. Opera’s ad blocker is turned off by default when you first download the browser. To activate it, simply open the “Easy Setup” panel and toggle the “Block ads” switch. The browser will start blocking ads on all websites. However, if you want a specific page to run ads, you can make an exception and turn off the ad blocker for that page. You can do that in by clicking the ad blocker icon in the address bar. 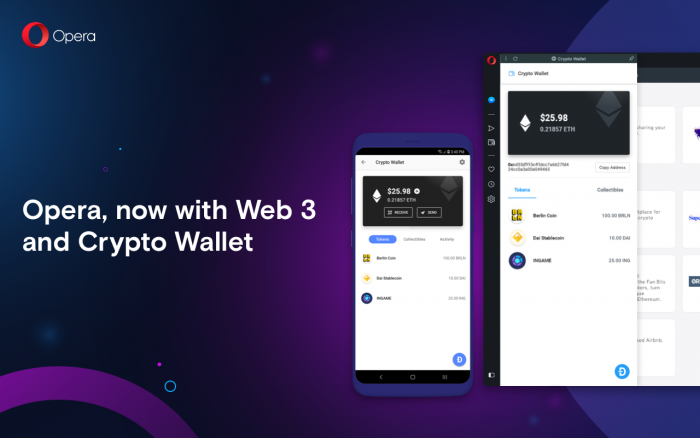 The Crypto Wallet, which lets you store cryptocurrency but also tokens and collectibles in the Opera computer browser syncs with the Crypto Wallet in the Opera browser for Android. This means wallet keys never leave your smartphone. In practice, whenever you need to identify yourself to a Web 3 website or sign a transaction on the blockchain, you will get a notification on their smartphone. You’ll be able to confirm it in the same way you unlock your system, using, for example, facial recognition or a fingerprint. 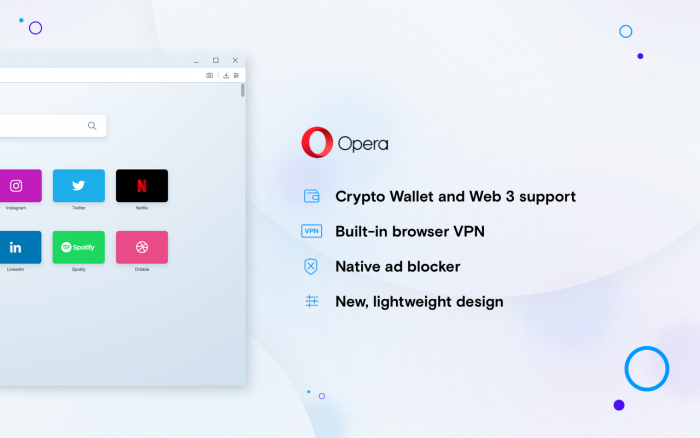 Opera’s built-in VPN, ad blocking and Crypto Wallet make it the only modern browser to put you in complete control over your digital life, while also giving you a glimpse of the future of the Web. In the world we live in today, we feel this couldn’t be of more importance. We created a short film we titled “Escape” in which a woman travels through a futuristic world in search of regaining control of her digital life. You can watch it here. The Opera browser features two special edition animated themes inspired by the film. Try them out by going to the Easy Setup section in the top-right corner of the screen. All changes are listed in the changelog.